Join Beyond Investigation Magazine for an ACTUAL paranormal investigation from anywhere in the world! Have you ever wanted to be a Paranormal Investigator? Well now you can! Some investigations conducted by Beyond Investigation Magazine are conducted with real-time communications over the internet. Subscribers become off-site members of the investigation team. Our "Virtual Paranormal Investigators" or V.P.I's, use our "Ghost Chat" web interface to engage in two-way text-chats with the on-site team members. 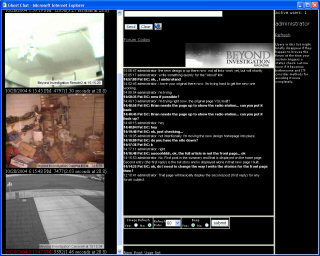 Ghost Chat also gives the VPI live images from the site as the investigation is in progress. VPI's also have access to much more information, sometimes even more than on-site team members. VPI's can listen to live audio from the site and download higher quality audio files for offline analysis. VPI team members can view detailed diagrams of the site under investigation, high quality onsite imagery, and even some background discovery that precede investigations. Beyond Investigation Magazine investigations are conducted with attention to details that maximize the amount of "context" available to our VPI team. It's all meant to immerse our VPI team members in the investigation to make them as valuable in the investigation as our on-site team members. All from the comfort of their own living room. Subscribe today and join in the action!